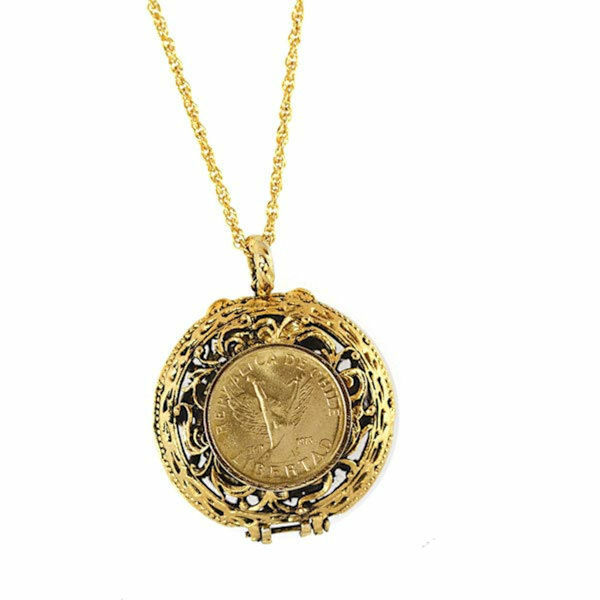 The cover of our round filigree locket frames the captivating Angel Libertad coin from Chile. When opened it reveals a single mustard seed, the age-old symbol of faith and hope, along with the inspirational Biblical verse from Matthew 17:20. Delicately engraved and suspended on a 24" gold tone chain, this lovely locket holds a very special message. The locket stays securely on the chain with a lobster claw clasp closure. A Certificate of Authenticity is included. Allow 2-3 weeks for delivery. No rush delivery or gift box. Item can only be shipped within the Continental US.